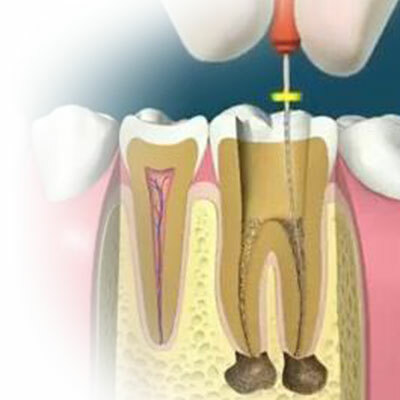 Endodontics, better known as the root canal treatment, is pulp removing procedure. The pulp is the combination of nerve and blood fibers in the tooth. The role of the pulp is to bring nutrients to the tooth through the blood vessels. However, a tooth with extracted pulp can remain in the jaw like all other teeth. The root canal procedure is done using local anesthesia and is completely painless. Depending on the cause, the procedure itself can be done in one or more appointments. After the root canal procedure has been completed, the tooth must be properly reconstructed. Because these teeth are more prone to fracture, our patients at Life Smile Dental by Dr. Navarrete are advised that the tooth on which this procedure is performed, also have the inlay, onlay or a porcelain crown done. Only this way we will it be absolutely certain that these teeth are properly protected from a fracture. Why do we get an inflammation of the tooth? The inflammation of the nerve in the tooth is most likely caused by bacteria. The pain is sharp and doesn’t go away by itself. The bacteria can come to the nerve trough deep cavity. Bacteria then enter the pulp and create the inflammatory response of the organism. This inflammation is accompanied by severe pain, and sometimes with a swelling. Another way that the bacteria can come to the nerve is through the gums. This can be the case when a patient has a periodontitis. If you had some major trauma or you were hit in your mouth area, a tooth can be injured. In some cases, the fracture is small and the pulp of the tooth is not endangered. In these cases, a simple tooth filling can do the job. However, the fracture can sometimes be so deep that it reaches the nerve. In these cases, it is necessary to do the root canal treatment. After that, we suggest that you make a porcelain crown on top of that root canal, so the tooth is well protected.